I just saw the cutest idea ever online, and I have to share! It's a gift to give guests if you are hosting a NYE party. Fill a gift bag with an airline bottle of Vodka, a can of V8, a few Advil, and some saltines. Voila...Hangover Kit! If I was hosting a party this New Years, you better believe I would be sending all my guests home with that cheap, and clever gift! Do you think this movie would make a good add in? 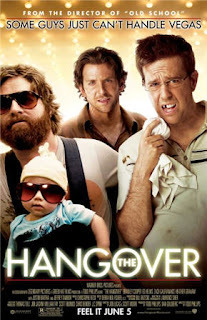 I love this movie, but I wonder if watching The Hang Over while hung over would be slightly more painful. That's a really good idea, I'd love to get a hangover kit after a NYE party!